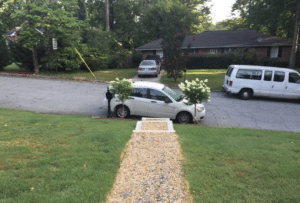 So, it got me to thinking… Do people really know how to be a good neighbor? I could list wonderful ways such as sharing sugar, giving holiday gifts, and having one another over for dinner. However, I’ll just stick to the basics. In real estate, one of the first questions buyers want to know before making an offer on a home is “How are the neighbors?” And, rarely, do they get an opportunity to meet them prior to going under contract on the home unless we just get really lucky and meet them during a showing! So, we look for all the signs of hitting the neighbor jackpot before actually meeting them. Is their yard nicely maintained? Mowed? Edged? Trees Trimmed? Is their home well maintained? Or is there rotten wood? Signs of deterioration? Deferred maintenance? Where are their cars parked? What condition are they in? Are they up on stilts in the driveway? Are pets running loose? Barking loudly? Growling from afar? All of these are questions I’m trying to answer when touring a home that a client LOVES! Because, not only are my clients going to have to live near them, but neighbors also can have an affect on their home’s value. And… you think I’m kidding! Can’t tell you how many times we’ve lost buyers on listings because the neighbor had noisy chickens, their house was boogery, or the pit bull was frightening. Seriously, it happens. So, be a GOOD neighbor! Show pride in your home. Properly maintain your home and yard. Be considerate of your neighbors whether that’s parking your car in appropriate locations or keeping your pets maintained and quiet! Looking for a home with better neighbors? The Peters Company can help! Give us a call at 404-419-3619 today! ← Just Listed :: Amazing Midtown Townhome!